Editor’s Note: As we celebrate Pumps & Systems’ 25th anniversary this year, we have published articles from 1993 and asked experts from the same companies as the original author(s) to give our readers an idea how that technology has changed since that time. For this month, here is an excerpt from the August 1993 article, followed by an update on choosing vacuum technology for chemical and pharmaceutical processes. Many other types of vacuum pumps are available, but the remaining types (diffusion pumps, cryogenic pumps, turbo-molecular pumps, ion-pumps, etc.) are generally not considered practical or economical for rough vacuum uses, such as those found in chemical and pharmaceutical applications. These pumps are normally applied in high vacuum industries like semiconductor manufacturing. Henry H. Hesser was a staff technical specialist at Busch, Inc. when this article was first published in Pumps & Systems in August 1993. Hesser earned a Bachelor of Science in chemical engineering from the University of Texas and a master’s degree from the University of Delaware. At the time, he had 20 years of experience in cost estimating, financial analysis, government compliance standards and major engineering projects for the chemical and pharmaceutical industries. Here is the original article published in August 1993. Selecting the right vacuum technology for chemical and pharmaceutical processing applications is often difficult. First, a vacuum system must deliver the required pumping speed at operating pressure and ensure the required pump downtime. Second, it cannot be sensitive to process gases and must meet all requirements when it comes to CIP (clean-in-place) cleaning and gas recovery. Reliability and economic efficiency also play a significant role when deciding which vacuum technology to use. Dry screw vacuum technology is widely used in the chemical and pharmaceutical industries. The first dry screw vacuum pump for use in the chemical and pharmaceutical markets was launched in the 1990s. These pumps have an advantage since they do not require operating fluid to compress the process gas. In a screw vacuum pump, two screw-shaped rotors rotate in opposite directions. The pumped medium is trapped between the cylinder and screw chambers, compressed and transported to the gas outlet. During the compression process the screw rotors do not contact each other or the cylinder. Precise manufacturing and minimal clearance between the moving parts enable this operating principle and, in addition, guarantees a low ultimate pressure of less than 0.1 Torr. 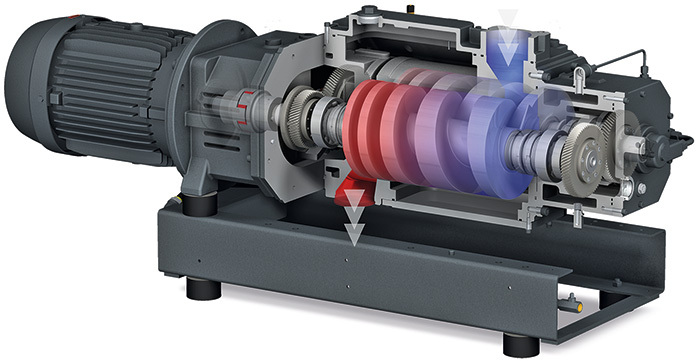 Modern screw vacuum pumps have a variable pitch screw, which results in even compression of the process gas across the entire length of the screw. This has the advantage of ensuring the same temperature throughout the entire compression chamber, which can easily be monitored and controlled. Screw vacuum pumps use a cooling jacket, ensuring even temperature distribution and greater thermal efficiency and stability throughout the pump body. Generally, dry screw vacuum pumps operate at temperatures sufficient to prevent condensation of the process gas. This enables the process gas to avoid contamination by, or reaction with, an operating fluid, as well as preventing corrosion due to process liquids attacking the pump materials. Ductile iron is the standard material used for process wetted parts that contact the pumped medium. The metal has special coating to make it resistant to nearly all chemicals. In most applications, it is recommended to warm the pump prior to process operation and purge the pump with inert noncondensable gas (generally nitrogen) to remove the process vapor prior to shutdown. In some applications, it is also recommended to flush the vacuum pump with a suitable cleaning fluid to remove process material that are in the pump prior to shutdown to avoid deposits forming as the pump cools. Flushing capability is another characteristic of the dry screw pump that arises, because the pump does not use an operating fluid. With different compression systems and various coatings, screw vacuum pumps can be configured to be compatible with any chemical.